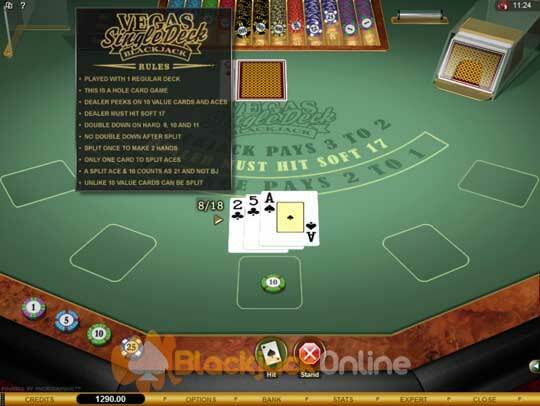 One of the more popular Microgaming software powered Blackjack games is this Single Deck variant, known as the Vegas Single Deck Blackjack game. Its popularity is due largely to the fact that only one deck of cards are in play in the shoe. 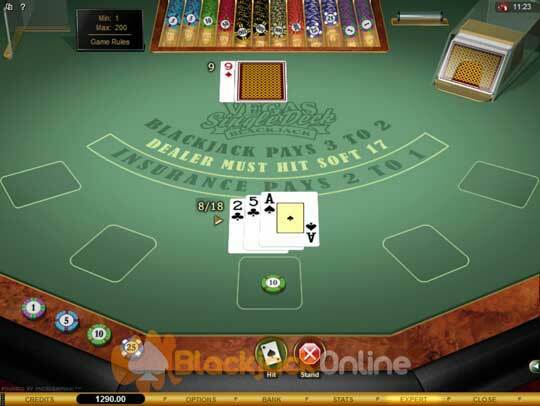 However, it isn’t the most generous of games by virtue of the fact that its house edge, when played with perfect strategy, works out at a high 0.46%, so maybe you would be better of finding another Microgaming Blackjack game to play! We do have a Single Deck Blackjack Strategy Card (see below) available, should you wish to download it, this strategy card shows you how to play every possible hand when faced with any dealers card. Playing a Pair of Sevens - Should you have been dealt a pair of sevens, then several different betting decisions become active, however you should only stand this sort of hand when the dealer is showing a ten, if the dealer has a eight, nine or an Ace then hit your pair of sevens, at all other times you should split your pair of sevens. Taking the Insurance Wager - The Insurance wager is a very bad betting proposition for players, this is due to it having a large house edge attached to it. So always decline this wager when offered by the dealer. Playing a Hard 16 - If you have been dealt a hard 16 by the dealer, then take a look at his face up card, and if it is a 2 to 6 valued card then stand your hard sixteen, however if he has any other card namely a 7 to Ace card, then hit your sixteen valued hard hand. Double Down on a Pair of Fives - You should always double down when you have been dealt a pair of fives when playing Single Deck Blackjack, unless of course the dealers facing up card is a ten or an Ace, if it is then the correct strategic move to make is for you to hit that pair of fives. Dealer Rules - All of the cards in the one deck shoe are shuffled before a new hand is dealt out, and when the dealer is dealt any Ace or Ten valued card he will take a peek at the downward card to check for Blackjack. The dealer will also hit any hand with a value of a soft 17 or lower. Player Rules - In regards to the rules of doubling down, a player may opt to do this on any hard nine, ten or eleven. A player can only split a hand once, and will not be able to double down after splitting, and will not be able to draw to a split Ace as only one card is dealt to split Aces. Payouts - All winning Insurance wagers are paid at 2 to 1, a winning standard hand which includes Ace and Ten hands formed after splitting pay even money, a winning Blackjack hand pays 3 to 2.